When people think of a key ring, they tend to think of the traditional set of keys, like their house key, car key, maybe a mailbox key and a random assortment of work keys. However, in today’s day and age, where technology is king, a simple collection of metal simply won’t do. People have phones to charge, places to go and gadgets they can’t live without. Key rings are an extension of people’s everyday necessities, and since everyday necessities have evolved with the advancement of technology, the team of experts at MyDriverLicenses.org have compiled a list of five innovative items you should always carry on your key ring. USBs are so useful when it comes to storing information, but they can be difficult to keep track of when they’re pushed to the bottom of your bag. Nowadays, most USBs come with a small loop so you can attach them to your key ring. The team at MyDriverLicenses.org recommends you attach your USB to your key ring, so that you don’t have to worry about losing it the next time you take work home with you. You never know when you’ll need to take a look under your car’s hood in the midst of a calamity, and the experts at MyDriverLicenses.org want you to be able to check your vehicle safely, which is why keeping a mini flashlight on your key ring is essential. Currently, you can find keychain-sized flashlights just about anywhere online. These are especially useful when you need to check something out in your vehicle but can’t quite see what you’re looking at. Although key ring-sized charger ports typically won’t get you to 100 percent battery, they’re useful when you’re out and about and need to give your phone a light charge. In any case, the team at MyDriverLicenses.org reminds you to keep your portable charger charged, as it won’t be of much use if you’re out and about with your phone at 20 percent battery and your charger at even less. Instead of shuffling through your keys every time you’re at your front door, simply use a key organizer to assist you. Organizers are not only fantastic for keeping your keys organized, they also prevent your keys from scratching your phone or other valuables that may be packed in your bag. Key organizers come in many different styles, so you can find one that suits you and your needs best. 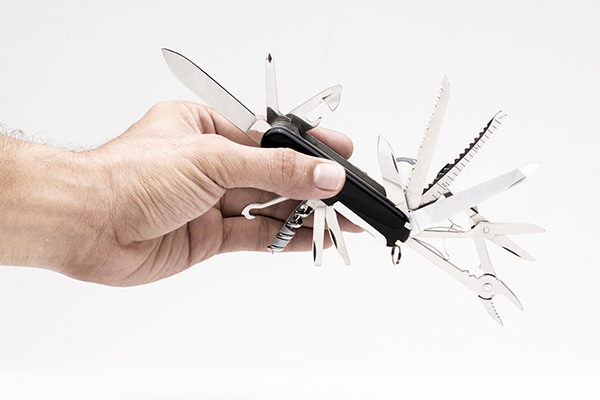 Even in a miniature size, Swiss Army knives are useful for just about any situation. Whether you’ve got a loose thread on your work shirt or you’re trying to unjam a button in your car, carrying a Swiss Army knife on your keychain ensures you won’t be left without a solution. The team at MyDriverLicenses.org reminds you that you can even use a Swiss Army knife to adjust any screws or bolts that might come loose in your car.